I've found a new variable star, but I can't identify the type of it. 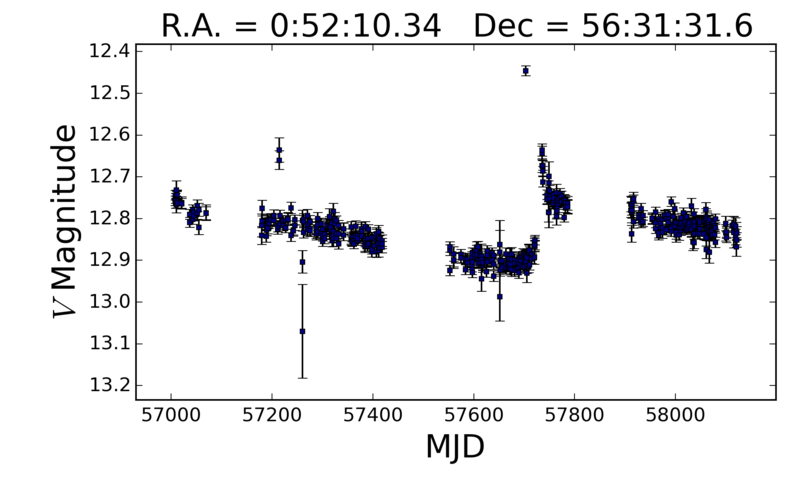 My friend suggests it could be a cataclysmic variable, as we can see a possible outburst (~2457725), making the light curve jump a little. The rest shows steady decrease of brightness. Simbad shows it's a young star with emission lines, laying in NGC 281 nebula. Light curve is available in attachment. Does anyone have ideas of it? Cataclysmic variables emit weakly in the infrared range. Most likely this is a YSO object. And the presence of emission lines also suits the curve. Most likely there is no period here. I think this is a cataclysmic variable of the type UG. The maximum of outburst was not registered. This star is the source of X-ray CXO J005210.0+563130. X-ray is not great, but for UG type of star is very red. The star is not very red. These data correspond to a spectral class of approximately K7-M2. UG: " They are close binary systems consisting of a dwarf or subgiant K-M star... The spectrum of a system at minimum is continuous, with broad H and He emission lines... These systems are frequently sources of X-ray emission." How can these stars have an interval between flashes of almost 1000 days? At such an interval, the brightness should increase by at least 5-6 magnitudes. With such a flash, the maximum should be fixed. Here in general the graph is more like a supernova, but with a very small amplitude. Large intervals between outbursts are normal. An example, GK Per. The interval between outbursts can exceed 1000 days, amplitude 1 - 3 mag. In the ASAS-SN data at the time of outburst there are no observations for 2 weeks, so the outburst was not detected. This star should be observe constantly. This object appears in the catalogs of the YSO VizieR. "Multiwavelength Study of the NGC 281 Region"
How interesting. Was I right from the start? I'm interested in the objects of "YSO". I recently started searching and observing these objects. This is a good example. Not all X-ray sources are "UG"
Why do not you register this star at the base of the VSX? Nikolay, there is a process to work through. See this page, about half way down. where it says VSX Submission Form in blue. Try now, Nikolay. I had an extra space at the end fo the URL. Sorry.